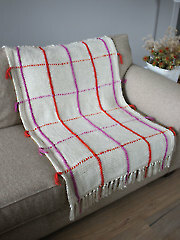 Host Deborah Norville believes nothing says you’re special like a handmade afghan, it’s like a perpetual hug from the person who stitched it. 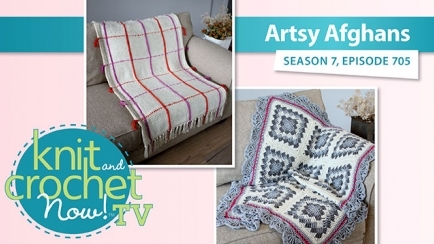 Ellen is first up with the Geometric Crochet Afghan, which features a lace border, and then Kristin shows how to stich up the Windowpane Afghan, which is knit in the round, then cutting it to make it flat! In the stitch corner Ellen teaches how to Crochet a Cable. 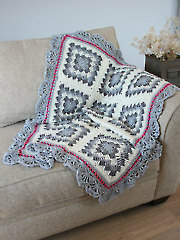 I enjoy Knit and Crochet now and am making afghans for our grandchildren for Christmas. The Windowpanes Afghan is for our youngest grandson and I'm using his hockey team colors (red/white/navy blue) and adding some logo patches for the team. Dottie - Dottie, thank you for making us aware of this issue. We're posting an errata for the pattern on our site which can be found in the "Pattern Services & Revisions" link. Wow! 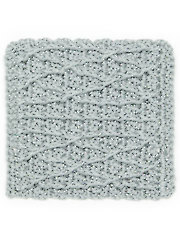 This crocheted afghan that Ellen is demonstrating is stunning! I'm not sorry I purchased them not and Crochet Now club for a year. I own seasons 1-5 on video.This is by far my most favorite program on tv. I think all the patterns from all shows are on the website Irma. I love how Deborah adds her own personal stuff to the show. Really really enjoy it! I really enjoyed all the free pattern opportunities. I only wish I could have gotten the one I really wanted in earlier seasons. Oh well, I guess I will have to come back and purchase it when I get the chance. Thank you for allowing me to obtain awesome patterns from the comfort of my home. Keep up the great work on current and future episodes of Knit and Crochet Now! My favorite show!!! !